"LIVE FROM SPACE," a live, two-hour special program originating from Johnson Space Center (JSC) and including appearances by the International Space Station (ISS) crew, is scheduled to air world-wide on the National Geographic Channel on Friday, March 14 at 8 p.m. Eastern Time. Co-hosted by television journalist Soledad O'Brien and veteran astronaut Michael Massimino, this program will be broadcast live from the viewing room overlooking the ISS Flight Control Room in the Mission Control Center at JSC. This program will feature stories about the mission and science being conducted aboard the ISS plus several live interviews from orbit with NASA astronaut Rick Mastracchio and Japan Aerospace Exploration Agency (JAXA) astronaut Koichi Wakata. 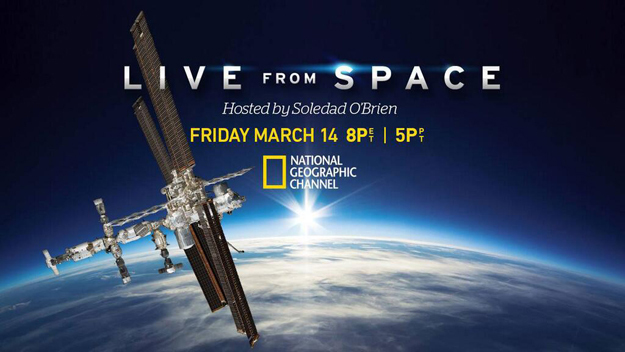 View this special program on Friday, March 14, at 8 p.m. Eastern Time on the National Geographic Channel.